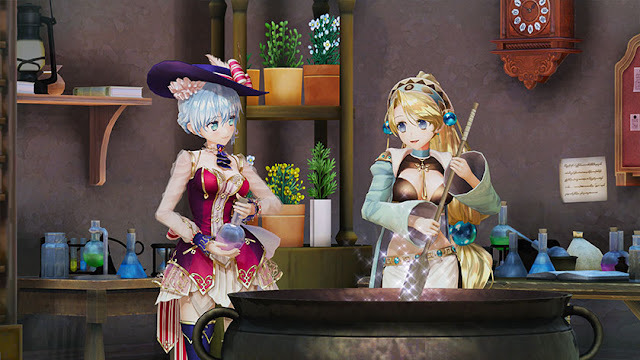 In the last catch-up, I expressed concern that the upcoming town-building spin-off of the Atelier series seemed like it was being set up to bee free-to-play. It turns out, I was incorrect, and I’ve never been so happy to be so wrong. The first detail I noticed from the new website for Nelke and the Legendary Alchemists: Atelier of a New Land was the pricing, as each version has a different price. The biggest and most impressive/expensive of the game’s version offerings is the 20th Anniversary Box. The price ranges from 25,100 yen for the PS Vita version to 26,100 yen for the PlayStation 4 and Switch versions. It includes a copy of the game, a code for a Nelke-exclusive costume, an art book, a one-disc soundtrack, a B2 cloth poster, a mini metallic clear poster, 50 tin badges featuring previous Atelier series characters, an acrylic Nelke figure, and an extra-large cloth poster. That all the Atelier anyone could ever need! The Premium Box is also full of goodies, although not quite as many. Costing 9,800 or 10,800 yen, it includes a copy of the game, a code for a Nelke-exclusive costume, an art book, a one-disc soundtrack, a B2 cloth poster, a mini metallic clear poster. The standard edition, including a copy of the game and nothing else, has three different prices: 6,800 yen for the Vita version, 7,800 yen for the Switch version, and 8,800 yen for the PS4 version. Nelke and the Legendary Alchemists: Atelier of a New Land will be released in Japan later this year, and a worldwide release would be unsurprising considering Gust’s success with the franchise to date. I’ve wondered why it has taken so long for a game developer to make a Kill la Kill video game. The anime franchise is a natural fit for video games. And now, courtesy of Arc System Works, we have just that game on the way. We don’t know too much about the game just yet — more details will emerge from the Anime Expo in July — but what we know about the anime and its heavy emphasis on combat, as well as the heritage of the developer (the mob that made BlazBlue), we’re anticipating some kind of fighting game. There’s a teaser trailer that doesn’t give away much at all, but it’s sure nice to know it’s happening, and we’ve only got a couple of weeks until we’ll find out plenty more about it. Little Dragons Cafe is the latest brainchild from Harvest Moon creator Yasuhiro Wada. The management sim has you running a cafe and raising a baby dragon, which I find endlessly appealing. D3 teased the title in the past week with a teaser website where finding and clicking an object would lead to a hint about the game. The teaser site also features this adorable cat, Sagashi Neko or Search Cat, who gets upset when children need help finding items. How rude. Disease: Hidden Object seems less humourous than the kitty: it’s about a former doctor who wanders in two worlds, unknowing of if what he sees is real or not. One world is real, while one world isn’t. Search for items and documents to discover the truth of an abolished hospital. Disease: Hidden Object is developed by OperaHouse Corporation, and will be released worldwide as a digital-only title.